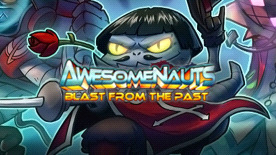 Get the "Blast From the Past" Skin Pack to unlock the Mousquetaire Leon, Kosmonaut Yuri, and Disco Voltar skins for use in Awesomenauts! This bundle will unlock the characters to which the skins apply if you have not yet unlocked them yourself. Requires Awesomenauts (base game) to use these DLCs.